338.2 nautical miles travelled, 70 hours and 48 minutes sailed, 4 boats, 3 islands, 2 countries, 2 locks, 2 rivers and one anchorage. At the end of May 2015 there was a Starcross Yacht Club "cruise in company" to the Channel Islands and France. Derek H kindly offered me a place on his Sadler 26 yacht. The table below links to GPS tracks and some photos from that trip. We left SYC on the Exe Estuary on Thursday 21st May for Brixham (in Devon), then to St Peter Port on Guernsey, on to Dixcart Bay on Sark, on to Gorey on the east coast of Jersey, then on to St Malo in France, up to Dinan on the Rance river, back to St Malo, back to St Peter Port and finally back to SYC on the Exe (30th May). Overall an excellent sailing trip with only one day out of ten lost to strong winds. Click the links below and then perhaps try the "Photos slide show" tab on the right hand side of each page or maybe the "Play" button on the "Replay GPS track" tab on the left hand side of each page. Sail down to Brixham Thursday 21st May 2015 A sail from Starcross down to Brixham ready for an early morning channel crossing to St Peter Port - Guernsey. Brixham to Guernsey Friday 22nd May 2015 A sail across from Brixham Marina to St Peter Port in Guernsey. St Peter Port to Dixcart Bay Saturday 23rd May 2015 A lovely sail across from St Peter Port on Guernsey to Dixcart Bay on Sark. Dixcart on Sark to Gorey on Jersey Sunday 24th May 2015 A very foggy sail from the Dixcart Bay anchorage on Sark round to Gorey on Jersey. Gorey to St Malo France Monday 25th May 2015 From Gorey on Jersey down to St Malo in France. St Malo to Dinan Tuesday 26th May 2015 From the Les Bas-Sablons marinas at Saint Servan (next to St Malo), a sail up the river Rance to the medieval town of Dinan. Dinan to St Malo Wednesday 27th May 2015 Back from Dinan to St Malo. 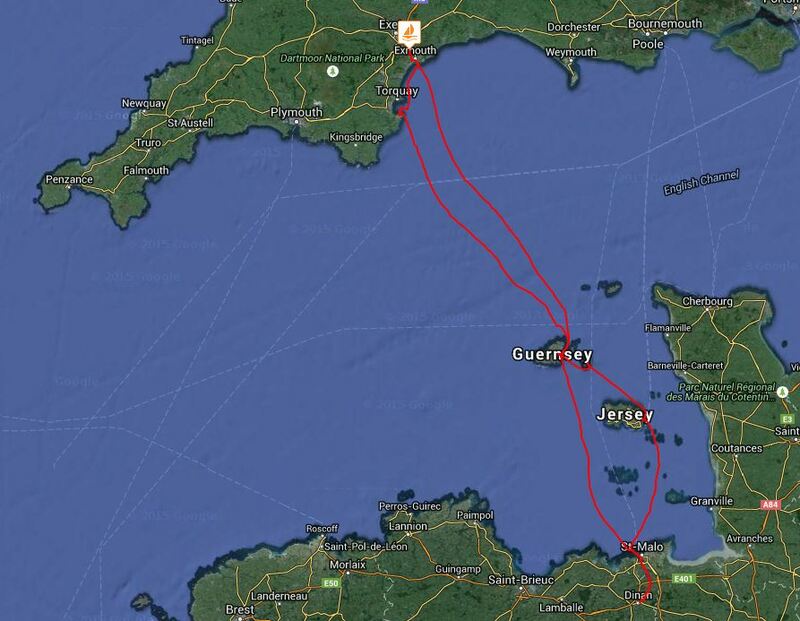 St Malo to Guernsey Thursday 28th May 2015 A sail back from St Malo to Guernsey. Stuck in harbour Friday 29th May 2015 Some big gusts of wind were predicted for this Friday so we sat the day out in St Peter Port marina. St Peter Port to SYC Saturday 30th May 2015 A stonkingly fast sail back from St Peter Port to Starcross Yacht Club on the Exe. Most of the data on The GPS Blog is publicly visible. However, a few activities and some photos are tagged as "private". If you know Liz or Aidan, why not click the button below to get in contact and be added to the list with full access.